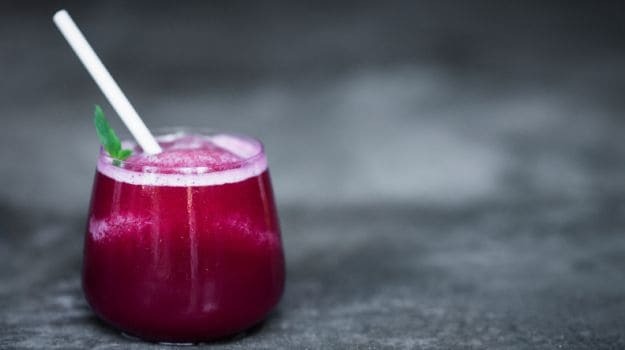 About Beetroot Shots Recipe: Beetroot and berries mixed together with some salt, pepper and vinegar to make these savory shots. This beetroot recipe is a great balance of healthy and tasty when packed with the goodness of strawberry, parsley and beetroot. 1.Preheat the oven at 200 degree Celsius. Peel the beetroot and boil till tender, say 20 minutes. 2.Slice the beetroot. In a mixing bowl, add olive oil, balsamic, rosemary, salt and pepper. 3.Add the beetroot and mix it well so it is evenly coated. 4.Arrange on a baking tray and roast it for about 20 minutes or you could simply saute in a pan. Let it cool. 5.In a food processor add the beetroot and the berries and blend it well. 6.Add some water if need be. You want a consistency of a flowing cream. 7.Adjust the seasoning again, chill in the fridge. 8.Serve with a little sprinkling of chopped parsley.